Instant fairness is a reality now! 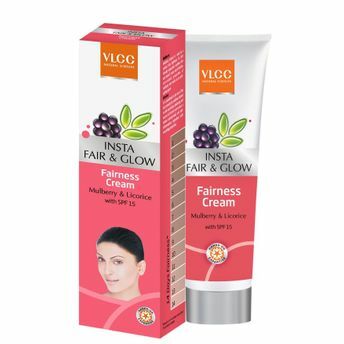 With a breakthrough formula, enriched with Mulberry and Licorice extracts that lightens skin tone and makes it glow, the VLCC Insta Fair & Glow Fairness Cream prevents skin tan and re-energizes it. Explore the entire range of Face Moisturizer & Day Cream available on Nykaa. Shop more VLCC products here.You can browse through the complete world of VLCC Face Moisturizer & Day Cream .Alternatively, you can also find many more products from the VLCC Insta Fair & Glow Fairness Cream range.